She should be past the tears, she cries some anyway. It's never easy… letting go. Letting go of our children is probably one of the most challenging aspects of parenthood. When my husband was in the first grade he announced to his mother that he was running away. Much to his surprise, his mom didn't waste any time packing him a lunch. She even made a little knapsack and tied it to the end of a stick for him. Then she kissed him good bye, wished him Godspeed and closed the sliding doors behind him. After giving it a little more thought, the young rebel decided he would just stay on the porch steps and eat his lunch. There's a great analogy in that story. Sometimes we have to let go of our children before they see where they've gone wrong and decide to turn around and come back. If we hang on or try to be their friends out of fear and desperation, then we won't be the parents God intended us to be. We'll be so worried about losing them that we'll compromise our own principles just to get them to stay. I heard Dr. Phil say that we're not raising children; we're raising adults - and we have a responsibility to prepare them for real world situations. We're not doing our children any favors to spare them from the harsh realities of life that they will one day be forced to face. Recently, one of my nieces informed her mother that she plans to move out of the house as soon as she turns 18, which will be in the fall of her senior year. Initially, this upset my sister greatly, and she pleaded with her daughter to stop saying that. Then my niece replied, "Well, Mom, if you would quit being so controlling and lighten up on some of your rules, maybe I wouldn't have to move out." Mission accomplished. What can I say? The girl is good. But after pondering the situation a little longer, my sister viewed things in a totally different light and she went back to her daughter and said, "You know, I've established these rules for our home because I feel they're important and that's my responsibility as a parent. So if you decide that my rules are too restrictive, then maybe you should move out." Amazingly, her daughter suddenly had a dramatic change of heart. "Well, I haven't made any definite decisions yet, Mom." When my kids were little I would mother-hen them to death. Keen used to say, "Let them go outside without a hat; they'll learn to wear a hat when their ears get cold." I finally came to the realization that there are some lessons only life can teach them. On the first day of school last fall, (which also happened to be one of the hottest days of the year), our 14-year-old son, Kirk, decided to wear a sweatshirt. I was tempted to say something, but I bit my tongue. When he came home from school that afternoon the first thing he did was tear that sweatshirt off. "Man, was this shirt hot!" he said. "It was like wearing a blanket!" The next day I was working in the yard and I noticed that it was almost 8:00 and Kirk hadn't left for school yet. I was concerned that he would be late, but once again, I zipped my mouth. How will he learn to budget his time if I don't let him fail? When he finally came outside to get in his car, I gave him a hug and told him to have a good day. Sure enough, he ended up having a hard time finding a parking spot and he was almost late for assembly. But he learned a lesson - not because I said or did anything - but because I didn't say or do anything. He learned because he experienced firsthand the stressful consequences of cutting his time too short. Letting go. It's not easy - but it's necessary. TO let go doesn't mean to stop caring, it means I can't do it for someone else. TO let go is not to cut myself off, it's the realization that I can't control another. TO let go is not to be in the middle arranging the entire outcome, but to allow others to effect their own outcomes. TO let go is not to adjust everything to my desires, but to take each day as it comes, and to cherish the moment. TO let go is not to criticize or regulate anyone, but to try to become whatever I dream I can be. TO let go is to fear less and to love more. It just isn’t right, won’t that be a sight? Living in a small town has its advantages and disadvantages. One of the advantages is that you don’t have to live amongst the hustle and bustle of a big city, yet you’re close enough to drive there when you need to. The down side is that everybody makes it their business to know your business. Maybe that wouldn’t be all bad if they got the story straight. But that’s not normally the case. Every rumor seems to have a thread of truth running through it somewhere, but it’s usually buried so deep that it barely resembles the original version. It’s like that game of operator we used to play as kids when one person would whisper a sentence into the ear of the next person and so on and so forth until it reached the last person in line. Who could forget how ridiculous the end result turned out to be! Another time, after we’d lived in Alma for several years, Keen was watching the kids for me while I drove to Minnesota to visit one of my sisters. When I was getting out of the car upon my return, my next door neighbor hollered, “So, did you decide you liked Alma after all?” I guess he thought I’d “flown the coop” before I came to my senses and returned to my family. Connecticut. During his speech, Keen talked about his dream of one day selling the trash business and earning a law degree. Well, he never imagined that it would get back to anyone in Alma, but just a few days after he returned he walked in the door and announced, “Guess who has a sister in Hartford, Connecticut?” Sure enough, an Alma resident had a sister who read about Keen’s speech in The Hartford Courant. (“Lessons Learned in a Fight for Rights”, October 3, 1998.) It’s a small, small world. When Gene Smith from The Topeka Capital-Journal interviewed him about the new journey he was embarking on, Keen made the mistake of mentioning our house in Manhattan. He was quoted as saying: "We've bought a house five blocks from the Student Union, so we can walk to school each day. We won't even need a car!" Boy, did that statement ever come back to haunt us! Everywhere we went, people were asking us when we were moving to Manhattan. One time a lady at the post office asked me about it and I explained the whole situation. Later in the day, I ran into her again at the grocery store where she overheard the clerk ask me the exact same question. “If you had a nickel for every time someone asked you that, you’d be rich,” she commented. Then the clerk replied, “Well, you need to put it in the paper so we’ll know!” I had to laugh because we did put an ad in the paper! We thanked all our customers for their past business and explained our future plans. “Although we own a house in Manhattan where Keen will have an office,” we wrote, “we will continue to make our home in Alma.” We thought that was pretty clear. But it was too late – the rumor mill had been set in motion and there was no turning back. One person came right out and asked me if Keen and I were still married. This person had received my Christmas newsletter where I went to great lengths to explain what I was doing and why, but she still didn’t seem to understand that I went to Nevada with the full support of my husband and family. She went on to say, “Well, your sister got a divorce so I thought maybe you did, too.” The last time I checked, divorce wasn’t contagious! An elderly woman from Alma (who also received my newsletter), called Keen on the phone recently. After making small talk, she came right out and asked, “Keen. Did Eileen leave you? Because I would just be sick if she did.” Keen did his best to calm her fears and assure her that was not the case. Whether he succeeded is anybody’s guess. But my all-time favorite small town story involves the time we were looking for a larger house to accommodate our growing family. We heard about a lovely, five-bedroom home for sale out in the country (which was what we’d always wanted), so I called the realtor to inquire about the selling price. After he told me, I politely explained that it was out of our price range and thanked him for his time. But before I could hang up, the realtor asked if I would mind leaving my name. I told him that I’d really rather remain anonymous since we weren’t serious buyers. He stated that he just wanted to be able to show the sellers that he had fielded some calls. After reiterating the fact that I was simply curious about the price, I reluctantly gave my name. I kid you not – within a week people started telling us how they’d heard we bought the Taylor house. I could not believe my ears. One woman at the doctor’s office said she’d heard we signed the papers on Friday and were moving in the following weekend. We even received a phone call inquiring about whether our current house would be coming up for rent. chance to get its pants on." I guess those humorous sayings about life in a small town are true: What we don’t know, we make up and we never let the truth stand in the way of a good story. We had a close call at our house last week. My son, Kirk called me in Nevada one morning before school to tell me that the carbon monoxide detector downstairs was beeping like crazy. The message on the alarm read, “Move to fresh air.” Well, Keen had already left for law school and Kirk didn’t know what to do. Thank God he called, because if he hadn’t, our house would have been filled with carbon monoxide by the time they returned home that evening and I don’t even want to think about what could have happened next. So I called Lane’s Plumbing and Heating and Danny Lane was able to check on the problem right away. He quickly discovered that our heating ducts were completely clogged because they hadn’t been cleaned out in several years. Yikes! Needless to say, we are thankful for the loud beep of our carbon monoxide detector. But sometimes life’s warnings aren’t quite that easy to hear. Sometimes we have to tune in and really listen to that still, small voice inside of us that some people call a sixth sense, gut instinct, or mother’s intuition. Whatever you call it, I believe it is God’s way of giving us some much needed direction in the affairs of our every day life. There have been so many times in our life when Keen and I have learned the importance of heeding that still, small voice. For example, when Keen was writing his weekly column called My Perspective, many people were angered by his criticism of the county commissioners. He was verbally harassed and physically threatened on more than one occasion. One night around 12:30 a.m., Keen woke up suddenly with the strangest feeling that someone had done some damage to his trash truck. So he got dressed and walked to our shop which was just 2 blocks from our home. He first walked all the way around the truck and kicked the tires, thinking that maybe someone had slashed them. Since they were all fine, he climbed into the cab of his truck to start the engine. Due to the ominous feeling he had inside, he was especially cautious as he turned the key in the ignition. Right away he noticed that the oil gauge wasn’t moving and he quickly turned the truck off, thereby saving the $10,000 engine. As it turned out, someone had removed the oil plugs in both of our trucks and drained the oil completely out of them. If Keen hadn’t been pre-warned by God, he never would have been watching the gauges that closely when he turned the truck on the next morning, and the engine would surely have been destroyed. Another example concerns a trip I took to Washington D.C. several years ago with my son, Josh. We flew out to attend a hearing at the United States Supreme Court involving a case about a tow truck operator from Northlake, Illinois who was removed from the rotation list after he made a political contribution to the sitting mayor’s opponent. So rather than listen to my gut and call other hotels, I just gave up and decided to stay with my brother. To make a long story short, our trip would have been perfect – if we had only stayed our own hotel room. It was a major hassle for Bob to give us directions to the subway and explain how to use it before he rushed off to work. Then it rained the whole day and Josh and I were left to wander the streets of D.C. aimlessly (with inadequate outerwear) all day long – slipping into one museum after another just to escape the cold, damp weather. Oh, how I wished I’d listened to that ever-so-subtle feeling that I should get a hotel room! Josh and I could have been nestled into the warmth of our room, enjoying pizza and a good movie. Then, when Bob got off from work, he could have picked us up in the hotel lobby to meet for dinner. Instead, we stood on a dark street corner (in the cold and rain again), waiting for him to pick us up and drive us back to his house. Now that may not seem like a big deal to you, but I really believe that God cares about every detail of our lives, and, if we are willing to listen, we can save ourselves a whole lot of inconvenience and discomfort. In other cases, it could be more than just a matter of convenience – it could be a matter of life and death. Like the time our son, Josh, decided to go driving around with some friends before the Friday night football game at Wabaunsee High. The driver of the car insisted that everyone fasten their seatbelts, and thank God he did because he tried to pass on a curve and met an oncoming car. The vehicle rolled several times and landed on its hood - leaving all four passengers hanging from their seatbelts. Miraculously, everyone escaped with only minor injuries, as did the driver of the other car. I have always tried to teach my children the importance of “listening to their heart.” So just out of curiosity, I asked Josh if he had any sort of red flag or bad feeling before he got in the car that day. He admitted that he did, but that he had ignored it. Who knows? Perhaps it was a “still small voice” that made the driver of the car insist that everyone wear their seatbelts, too. There are times when the voice may not be “still and small”, but rather “loud and large.” Greg Hawley, one of the owner’s of The Steamboat Arabia in Kansas City, shares an amazing story about the time they finally discovered the sunken ship they had spent so many years (and $750,000) searching for. He said two of the members of their team were in a deep, deep hole in the middle of a field when they suddenly realized they had located the ship. Loud cheers of jubilation rang out as they joyously celebrated the long awaited discovery. Then, all of a sudden, at exactly the same moment in time, both men heard an audible voice telling them to “Get out! Get out, now!” Without a moment’s hesitation, they scurried as fast as they could to the top of the deep canyon. Greg said that they had no sooner pulled the second man out when the entire hole caved in. So we just never know how important it might be to heed the warnings God gives us. Dorothy Masters from Harveyville tells a similar story in the first chapter of her book titled, Life is a Choice. Dorothy had been going “full-tilt” in the nursing profession for nearly 40 years and the stress had begun to take a toll on her mind and body. She not only suffered from severe joint pain in her hip and but she’d lost her sense of humor in the process. Well, one night she was walking down the hospital corridor during her night shift when she heard a voice say, “Get the hell out of here!” She walked a little further and heard the same voice say, “We have worked too hard….,” and then it trailed off. After tending to her patient, Dorothy took a deep breath and reflected on the voice she had heard in the hall. Suddenly she realized the voice was that of her late husband of twenty-two years, Loren B. Masters, who had died in a car-tractor accident eleven years earlier. Dorothy said that whenever Loren used that tone of voice when he was alive, someone was in great danger! Realizing that Loren, as her Guardian Angel, was telling her to quit work and enjoy life while she still could, Dorothy penned out her resignation and gave two weeks notice that very night. She’s never regretted her decision, and has now gone on to write two more books – Fun on the Run and Keep on the Sunny Side of Life. What an inspiration! In his latest book titled, Waking the Dead: The Glory of a Heart Fully Alive, author John Eldredge tells a story about the time he and his family vacationed at a ranch in Colorado where they enjoyed horseback riding, porch swings and campfires. The decision to return the following year seemed like a “no-brainer.” They had even considered making it an annual family tradition. However, when they prayed about it, they sensed God telling them, “Not this year.” It was hard to accept because everyone in the family wanted to go back, but they chose to cancel their plans.. Looking back, most of us can probably recall times in our lives when we, too, have felt that twinge of uneasiness tugging at our hearts. I truly believe that if we’ll heed that still, small voice in our hearts, we’ll be very glad we did. “And let the peace....from the Christ rule (act as umpire continually) in your hearts – deciding and settling with finality all questions that arise in your minds..."
By now some of you may be wondering how my book project is coming along and when I might be returning to Kansas. So I’ve decided to devote this article to filling you in on what’s been happening in my life since I embarked on my journey. I landed in Nevada on October 31st, just in time to drive to the Governor’s Mansion to watch my niece, Chloe Eileen perform an Irish dance for the Nevada Day celebration. Governor Kenny Guinn was on the grounds handing out candy to the trick or treaters and I was lucky enough to get my picture taken with him. The snow was falling and the governor’s mansion was beautifully decorated for the occasion – like something out of a movie. It was a very exciting way to start off my time in Nevada. Another memorable event happened one night when my sister, Mary and several of her friends and I went out to dinner at a local casino. 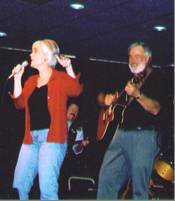 Afterwards, we listened to a singer by the name of Stew Stewart who has performed with many famous artists like Johnny Cash, Tammy Wynette and Garth Brooks. Mary heard him sing before when he came to one of the nursing homes where she works. Stew Stewart is quite a character. He likes to pull people out of the crowd and have them sing into the microphone. When he came around to me, I gladly chimed in because I love to sing. During one of the breaks, I decided to ask him if I could sing my favorite song – “She’s in love with the boy,” by Trisha Yearwood. I told him that I sang it at my son’s wedding, so he decided to take a chance on me. I thought I’d died and gone to heaven when he called me up on stage and let me sing with the band. But the real highlight came after I sat down and Stew called my name again from the stage. “I’ve never done this before in nearly thirty years of performing, but Eileen, can you come back again tomorrow night?” Are you kidding? Of course I can come back! After arriving in Nevada, I found a comfortable apartment nestled into the picturesque Sierra-Nevada Mountains. I’ve enjoyed many long walks on the mountain trails behind my place. My neighbors are all friendly, working adults, so it’s been very peaceful and quiet, too. My sister, Mary has been my right arm since I’ve been here. She helped me find the apartment, furnish it and get the utilities set up. She’s been my personal chauffer, taking me to the grocery store and Wal Mart and anywhere else I needed to go. She’s been my nurse and my number one cheerleader. Most of all, she’s been my friend. I honestly don’t know what I would have done without her. Whenever I tell her that it seems like she’s doing too much for me, she always says, “I have to take care of you. It’s my job.” I guess some things never change. As for the book, it’s almost finished – which is why I’m “almost home.” I didn’t plan to return until May 1st, but I’m too homesick to wait that long. So I’ll be flying home during spring break – just one week after the 30th anniversary of our first date (March 15, 1974). If I were to compare my book to a movie, I would have to say that it’s turned out to be more of a documentary. It’s a historical account based on court transcripts, legal filings, letters from lawyers, newspaper articles and personal recollections detailing exactly what conflicts arose from the time Keen was awarded the trash collection contract back in 1981 up through the U.S. Supreme Court decision in 1996. After I get settled in back at home, there are a few people I’ll need to interview. Then I’ll start in on the task of verifying my facts and editing the rough draft. Someone once said that there is no good writing – only good rewriting. The following quote seems to sum it up quite well. My next step will be trying to find a publisher. I plan to contact the agent in New York to see if she still has any interest in our story. If not, I’ll have to pursue other avenues, including self-publishing. But whether 10 people read it or 10,000 – this was something I had to do. We spent fifteen years of our lives (off and on) engaged in some sort of battle with the county commissioners. This is the history of our life and, with the help of God, I will see it in print one day. As for my family, they have survived pretty well in my absence. I so appreciate all the sacrifices they made to help me make this dream a reality. Keen has been the “go-to-guy” while I’ve been away. He’s such a great dad, I’m grateful that the boys have someone they can turn to whenever a problem arises. This has been a real time of bonding for them, too, which has been an added bonus. Someone asked Keen if he was keeping the house clean and his response was: “Clean enough.” He does all the grocery shopping and bill paying, and he and Kirk have become experts at laundry and ironing. Keen said that Kirk jumps up when he hears the dryer stop because he wants to get his clothes out before they get all wrinkled. And Kirk told me that he’s actually enjoyed the feeling of independence. He said, “If I need something for school, I throw in a load of laundry; if I have homework, I do it; and when I’m hungry, I eat. It’s helped get me ready for…you know…when I’m grown up.” Kirk has kept busy with basketball season and has continued to get A’s and B’s in school. I’m really proud him. Of course, the hardest part has been being away from those I love. I’ve missed everyone terribly and they’ve missed me. I guess absence really does make the heart grow fonder. Keen’s love letters have helped a lot, but its still been very difficult to be apart. Needless to say, we’re all looking forward to being reunited in a few short weeks. I’d like to close by sharing a few more excerpts from some of Keen’s love letters. It’s 10:30 p.m. Friday night – I can’t read any more. I must write you – express my love for you. Just thinking of you makes me happy. Being apart makes me focus on the many ways I love you. I’ll never take for granted the opportunity to be with you – stand next to you – to make your happiness my only pursuit. It is so cool to be married to you! You are on a path that seems imprudent to some, foolish to others; but to me – you are heroic, courageous and full of life’s passion. I know at times, it must be hard, but push on – as I will also – and we’ll meet at the finish line. Honey, we are on the eve of the rest of our life. It is so exciting! We are embarking on a journey – the destination – God only knows. Eileen, you are the strength in my muscles – the spark in my life. You are the music that plays in the soul of my being from sunrise to sunset.